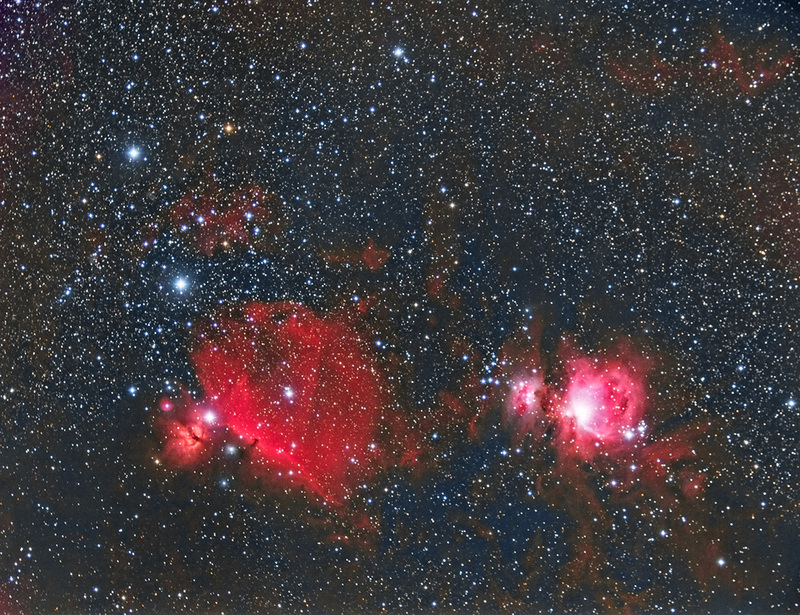 There is a section of space in the Orion Molecular Cloud Complex called Barnard’s Loop (Sh 2-276) that contains the dark Horsehead and bright Orion nebulae. This image is more or less the “center” of the loop. The stars within the Orion Nebula (on the right) are believed to be responsible for ionizing the loop as is Alnitak aside the Flame nebula on the left. Alnilam and Mintaka are also seen in Orion’s belt on the left. All this stuff is several hundred parsecs away and some of the coolest and well known of DSOs in the night sky. I tried to do something experimental (for me) here by replacing the Red channel with Hydrogen Alpha in a standard RGB integration. That’s is at least part of why it looks so bloody (because when Hydrogen electrons fall to their lowest energy level… like in an emission nebula… they release photons at 656.28 nm… which is quite red to our seeingballs). It turned out a little more cartoony than I’d imagined. I bet it could be toned down to look a lot better, but I just went with the first pass at it because I realized I just didn’t have enough green or blue channel data to pull this off. The Ha data was a lot deeper too… 10 minute subs versus 5 for the G and B.